(Modified from Pedigo et al. 1986). The lowest level of aphid infestation that has been shown to cause yield loss in soybean is several thousand aphid-days. This value, referred to as the damage boundary, is a biological relationship between the insect, crop, and environment, and is independent of crop and input costs. Below the damage boundary, no damage can be measured. Therefore, management efforts directed at treating aphid levels well below the damage boundary cannot provide a return on investment. 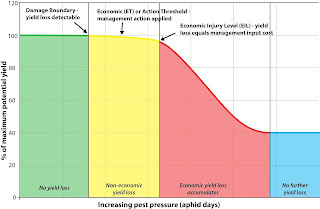 The economic injury level (EIL) is the point at which the yield loss from insect damage is equal to the cost of a management action, such as an insecticide application. Insecticide applications made to pest populations that have not reached this point, and are unlikely to reach it, would not provide any return. 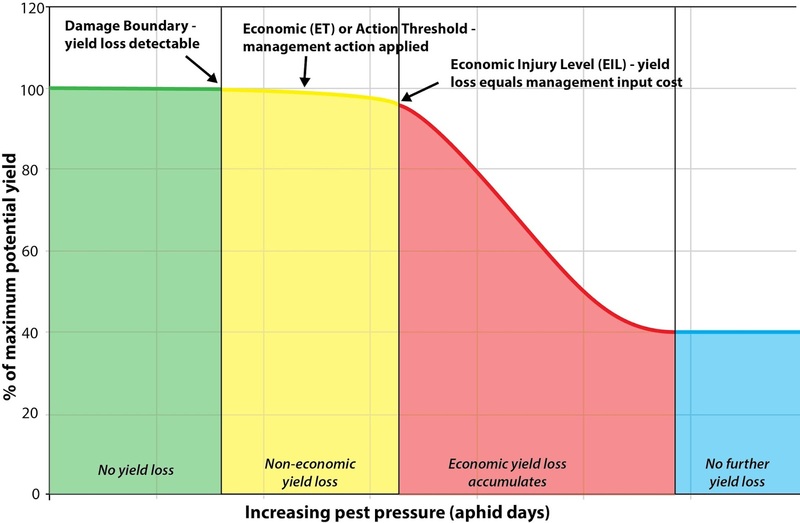 To more readily apply this yield-loss relationship to field scouting and aphid management, a value in terms of aphids per plant was calculated as the threshold to apply an insecticide to threatening populations. That brings us to the economic threshold (ET). This is the key number for management of the pest and is the insect population at which management action should be applied to prevent a growing population from causing economic injury. The ET can also be referred to as an action threshold or treatment threshold. In most thresholds for insect pests, including soybean aphid, the ET occurs well before the EIL to minimize the chance of the grower incurring economic loss. In fact, the ET for soybean aphid occurs before the damage boundary. In addition to costs, the ET may take into account factors like insecticide effectiveness, rate of insect reproduction, crop development, and lead-times for insecticide application. All of the values and statements above are based on data. To determine the values for damage boundary, EIL and ET for soybean aphid, thousands of whole-plant aphid counts were taken at frequent intervals through the growing season. Furthermore, the large multi-state data set that went into these calculations included a wide range of soybean growing environments, including moisture variation and other stresses. The economic threshold of 250 soybean aphids per plant, more than 80% of plants infested and aphid populations increasing (23) was established to prevent populations from reaching the EIL. These values were determined by closely monitoring aphid populations in research plots. It has been nearly a decade since the current threshold was developed and published, and University research continues to support these values. However, some people have questioned the continued validity of original soybean aphid ET of 250 aphids per plant, which was calculated including economic conditions from the mid-2000s. Calculations performed using current economic conditions (which are different now), but without regard to biology (which has not changed), may suggest that a lower ET should be used for aphid management. This is based on faulty logic. Aphid biology and how the plant reacts to aphids make the exercise meaningless. No significant gain can be found at those lower aphid numbers (remember the ET of 250 aphids per plant is already well below the damage boundary), AND low numbers of aphids often don’t reach the EIL. The soybean aphid ET is best viewed as a fixed action or treatment threshold, unlike some, more flexible thresholds for other pests. In the case of soybean aphid, raising the threshold reduces lead-time for applications and increases risk of economic loss from rapidly increasing aphid populations. Lowering the threshold may provide a bit more lead-time for insecticide application, but it also reduces the chances for natural enemies and the sometimes-harsh environment of a soybean field to solve the problem for you. Lowering the threshold reduces your ability to treat only those fields facing a reasonably high risk for yield loss. Therefore, a sliding scale that lowers the ET is not recommended. In university research across the North Central Region, treating below 250 aphids/plant resulted in no observable yield increase, supporting the conclusion that very low thresholds or zero tolerance of aphids is not necessary (https://www.ent.iastate.edu/soybeanresearch/content/extension). Again, there are no published, peer-reviewed data that show that soybean aphid damage is likely below the ET. Therefore, for a positive return on investment, treat only the fields that have a reasonable chance of reaching economically damaging levels. Lowering the ET below 250 aphids/plant will not save yield. Instead, it will result in spending money unnecessarily on many more fields that would not have had economic loss from aphid injury. This threshold is conservative in that it allows plenty of time for action on the producer’s part before yield loss could begin. This is particularly true during late soybean growth stages. NEXT UP COSTS OF TREATING SOYBEAN APHIDS EARLY and HOW DO YOU KNOW IF YOU HAVE A SOYBEAN APHID PROBLEM ?